Strength and energy, or liberalism and inexperience? 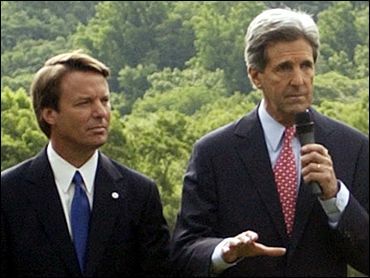 As John Kerry headed out on the campaign trail Wednesday with his new running mate, John Edwards, those were the competing labels on the new Democratic ticket. The two senators, their wives and children at their sides, appeared on the Kerry family's suburban Pittsburgh estate for family photographs, one day after Kerry chose Edwards as the Democratic vice presidential candidate. "We come to this with a deep, deep belief that America can do better," Kerry said. "Today, we're embarking on a new journey together." The two families were headed to Ohio and Florida to kick off four days of campaigning that will end Saturday with a rally in Edwards' home state of North Carolina. Over the next few days, the Democratic ticket will be in New York, West Virginia and New Mexico. Kerry and Edwards are scheduled to appear in their first joint TV interview on 60 Minutes, Sunday, July 11, at 7 p.m. EDT/PDT. But the fight over defining the Democratic ticket will be waged nationally. Sen. Elizabeth Dole, a North Carolina Republican, said Kerry himself had questioned whether Edwards had the experience to be president when they were rivals for the presidential nomination. "I think this may be a big flip-flop on the part of the No. 1 person on the ticket," Dole said on NBC. The Kerry campaign on Wednesday defended the selection by pointing to Edwards' service on the Senate Intelligence Committee and his participation in an inquiry into the Sept. 11, 2001, terrorist attacks. "He brings a great deal to the table and actually more than the current president did when he was elected in 2000," Mary Beth Cahill, the Kerry-Edwards campaign manager, told ABC. A senior Bush administration official suggested to CBS News White House Correspondent Bill Plante that Edwards' past as a trial lawyer would energize business opposition. The Republican National Committee called Edwards "a disingenuous, unaccomplished liberal and friend to personal injury trial lawyers." Mr. Bush's spokesman, Scott McClellan, didn't quibble with the tough descriptions. "Is there something in there that you're disputing?" McClellan replied when a reporter asked about the RNC accusations. "It's perfectly reasonable to talk about the differences on the issues and to talk about the record." Usually the White House defers to the Bush-Cheney campaign on political questions, but the administration is under increasing pressure and bracing for a Kerry jump in the polls. A CBS News poll finds that a majority of voters, and an overwhelming majority of Democrats, like the pick. But while Edwards' favorable ratings exceed his unfavorable ones by four to one, he is still unknown to a majority of registered voters: On the night after Kerry picked him, 53 percent expressed no opinion of Edwards. And 41 percent feel Edwards lacks the experience to be president, while 37 percent feel he possesses the right experience. CBS News has learned that a new Kerry television ad will begin airing in several markets on Wednesday highlighting the backgrounds of "a new team for America." "One is a combat veteran with over 30 years of experience handling the toughest issues facing America. The other is the son of a mill worker who all his life has stood up for ordinary people against powerful interests," the ad script reads. "Today they're a new team for America with a plan to make us stronger at home and respected in the world." In their appearance near Pittsburgh, Kerry and Edwards held their wives' hands and chatted and laughed as they walked across a field at the estate. The seven children between them followed. "John Edwards and his family represent a life of fighting to provide hope and opportunity for people," Kerry said, calling Edwards a man with "passion, conviction and strength." Edwards, a constant grin on his face, said he had assumed when Kerry called him on Tuesday morning that it was another reporter. "This is a great privilege for me — a great opportunity to serve my country, which I love so dearly," Edwards said. A smooth-talking Southern populist, Edwards won high marks during last winter's primary with his "two Americas" stump speech, depicting one America for the wealthy and privileged and another for everybody else. "It is populism without a sneering, snarling edge to it that I believe is a really powerful one for Democrats this time around," said Norman Ornstein, a political analyst at the conservative American Enterprise Institute. Kerry and Edwards both supported the congressional resolution authorizing Mr. Bush to go to war in Iraq and both voted against the administration's $87 billion request for Iraq and Afghanistan. Both advocate rolling back Mr. Bush's tax cuts for the wealthiest Americans but support other tax cuts for middle- and low-income people. Unlike Mr. Bush, they both support abortion rights and have indicated they would only nominate Supreme Court justices who share that view. Edwards supports the death penalty while Kerry opposes it except for terrorists. But capital punishment is far from the top tier of presidential campaign issues. Meanwhile, the Bush-Cheney campaign was preparing an ad suggesting that Edwards was second choice behind Sen. John McCain, a Republican from Arizona. However, the Kerry campaign said there had been no offer for McCain to reject. "There was no serious dialogue in the end, no offer in the end,"
, who ran the selection process for Kerry, told the CBS News Early Show. Democrats fired back with an Internet-only spot of their own, showing McCain criticizing the president's policies.